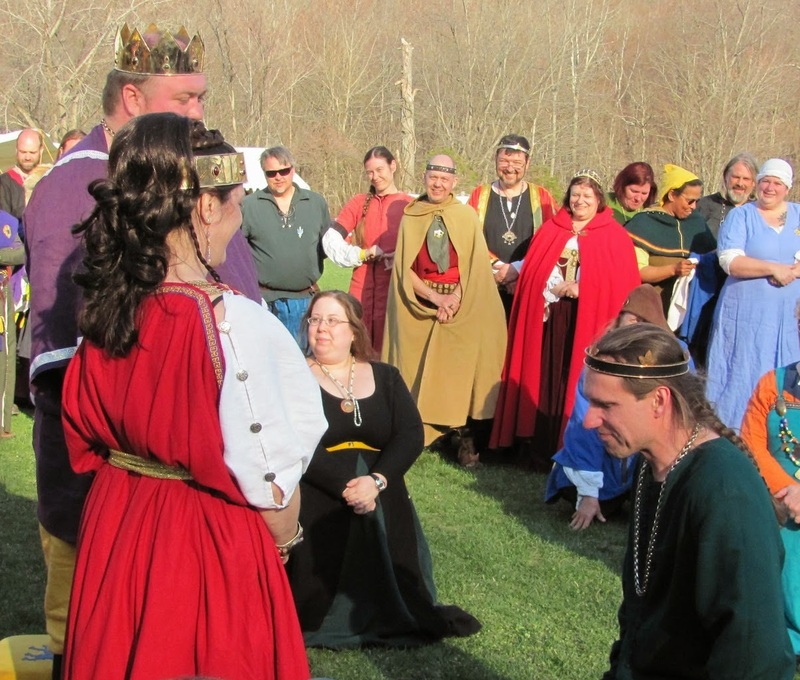 And it came to pass on 19 April 2014, AS XLVIII that Their Majesties Brennan Augustus and Caoilfhionn Augusta, Emperor and Empress of the Kingdom of the East, held court at Balfar’s Challenge. Katherine Ramsey, Autocrat for the event, and Duke Balfar were called forth, wherein they named and awarded the winners of the tourneys for archery, heavy combat and rapier. 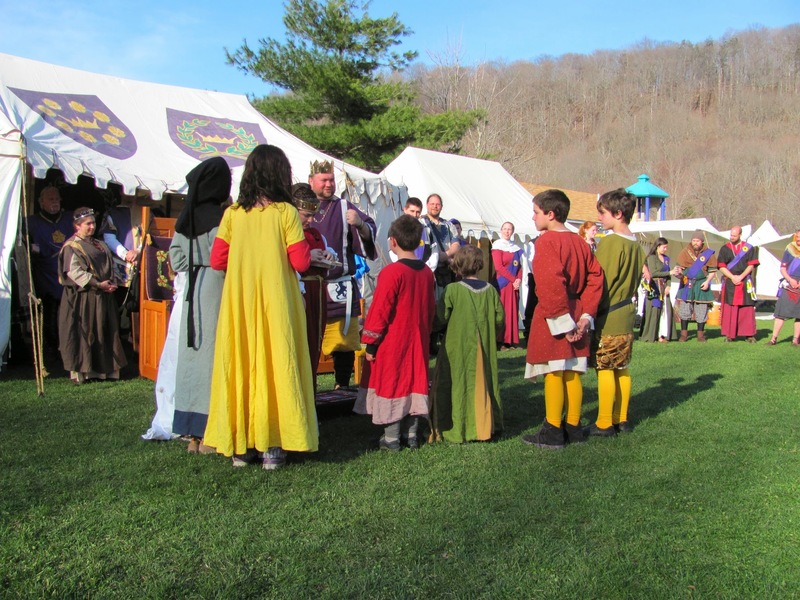 Cedric of Armorica stepped forth, and announced the victors of the Youth Combat Tournaments. Next, Miron d’Allaines-le-Comte was called before Their Majesties. Thus was he made a Lord of the court, and received an AoA with a scroll featuring words and illumination by Adrienne d’Evreaux, and calligraphy by Alexandre Saint Pierre. Then Guillome de Naverre was called forth before Their Majesties. He was made a Lord of the court, and received an AoA with a scroll by Xandra Rozina Xiberras Galea, called Rozi. His Grace Duke Kenric presented himself to the court, and swore his fealty to Their Majesties. So too did Vienna de la Mer, East Kingdom Chatelaine. Tristan de Worrell was next requested to be present before Their Majesties. His many good works noted, the companions of the Order of the Silver Crescent were called forth so he may join their ranks. Tristan received a medallion, and a scroll featuring illumination by Lisabetta Medaglia, calligraphy from Eleanor Catlyng, and words by Bronwen Rose of Greyling. Sir Osgkar, East Kingdom Earl Marshal, presented himself to Their Majesties and swore his fealty. Patrick Michael of Dragonship Haven was called before Their Majesties. He was unfortunately not present, and thus his squire brother approached the thrones in his place. 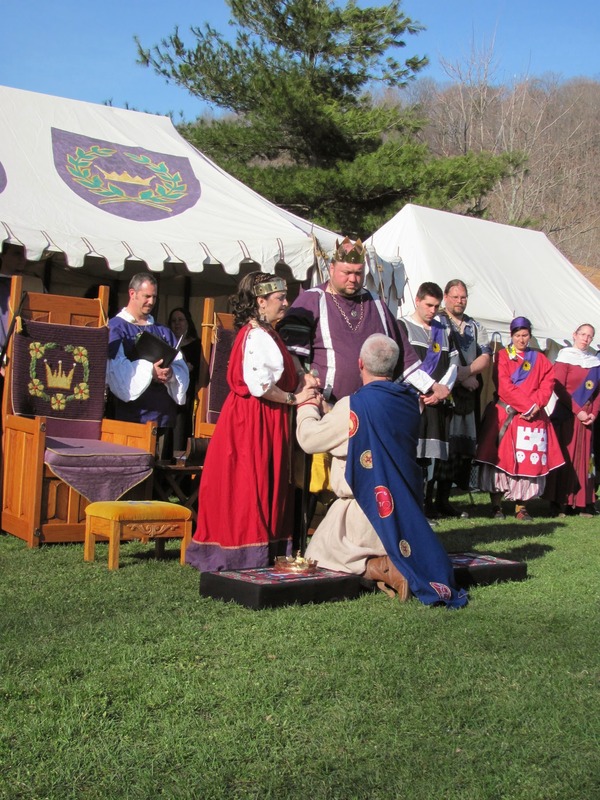 He was in absentia made a Lord of the court, and received an AoA with a scroll by Elisenda de Luna. Next was Her Majesty’s guard, Clarice d’Allaines-le-Comte, called forth. Much was said of her combat prowess, and thus was she inducted into the Order of the Gawain. She was presented with a garter from the arm of His Majesty, and a scroll by Katherine Stanhope. Next Her Majesty Caoilfhionn did call forth the nine children who had been participants in her service initiative. All were awarded beads for their participation, and given thanks. The rest of the children present were called forth. The Royal Toybox was presented, and a merry chase ensued around the field. Before this, Her Majesty was presented with a step to extend her stature when standing before the thrones. Gwilym of Fflint was called forward. He had, in the court of Their Majesties Kenric II and Avelina II been awarded arms. 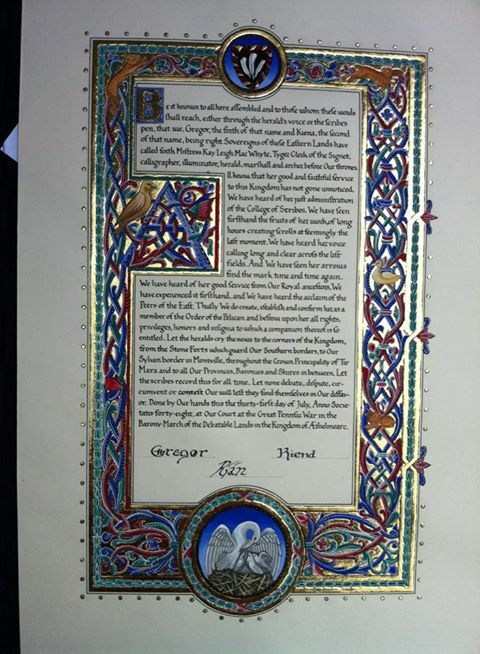 He was this day presented an AoA scroll with calligraphy by Elizabeth Greenleaf and illumination by Deirdre O’Roarke. Their Majesties invited before them Naomi bat Avraham. They spoke of her great service to the Kingdom, and requested the presence once again of the companions of the Order of the Silver Crescent. She was so inducted into the order, and presented a medallion and a scroll by Chrestienne la Pecheresse featuring words by Lillia de Vaux. Their Majesties did mark that the order was still incomplete. Thus was called forward Duke Edward Grey of Lochleven. He was inducted into the order for his long service, receiving a medallion and a scroll with illumination by Aesa feilinn Jossurdottir, calligraphy by Constance de St Denis, and words by Thyra Eiriksdottir. Her Majesty Caoilfhionn requested a moment before the Order. She thus read the words of Her Majesty Violante Regina Occidentalis, Queen of the West, awarding Duke Edward with Her Cypher. Their Majesties demanded the presence of Saerlaith Ingen Taithlig before their court. Though his Majesty spoke of her troublemaking nature, she was elevated to a Lady of the court, and presented an AoA with a scroll by Saerlaith ingen Chennetig. Next was Murdock MacRae called before the court. He was thus made a Lord of the court, and presented an AoA with a scroll by Aleksei Dmitriev. Called before the court of Their Majesties, Marieta Charay presented herself. She was made a Lady of the court, and received an AoA with a scroll by Cezilia Rapossa. At the start of the day, Their Majesties had held a brief court. Therein, they called forth Reyne Wurm, who had received writ from Their Majesties Kenric II and Avelina II to contemplate elevation to the Order of the Pelican. She was sent out on vigil to consider her answer. Now was Reyne Wurm called forth, as were the Peers of the Order of the Pelican. 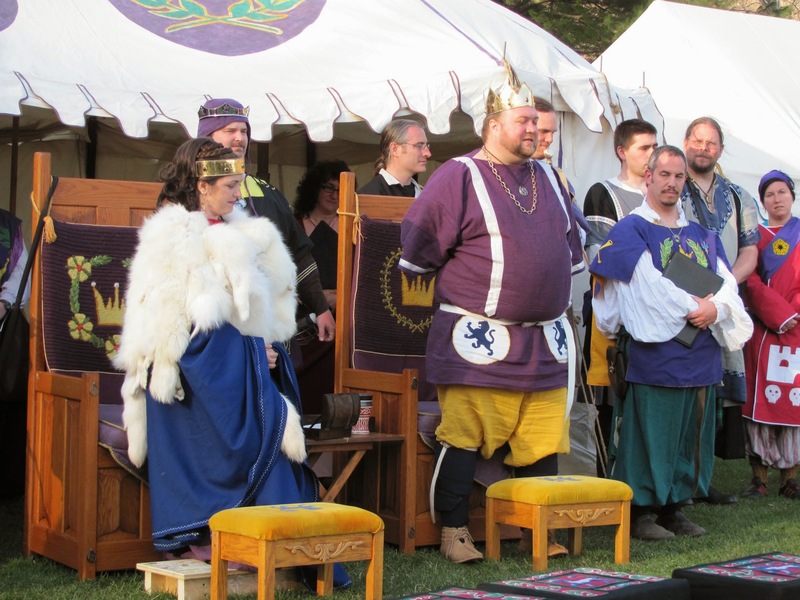 Following words commending Reyne to their majesties from Duke Balfar for the Order of the Chivalry; words were read from Master Adhemar for the Order of the Laurel; words were sent by Duchess Luna for the Lady of the Rose; and Master Joseph spoke for the Order of the Pelican. A mantle, pin and cap were brought forth as regalia. Reyne Wurm was then elevated to the Order of the Pelican, receiving a scroll that featured a woodcut block by Naomi bat Avraham, printing by Markesa Manuel de Carvahal and Fearghus O Conchobhair, with words by Adhemar de Villarquemada. Their Majesties thanked both their hosts and all attendees of the event for a wonderful day. Thus closed the court of Their Imperial Majesties, Brennan Augustus and Caoilfhionn Augusta. Long may they reign over the Empire of the East! PS – Thank you to the Heraldic staff for the day! Kenric æt Essex, Ryan McWhyte, Jehane de Fenwyk, Donnovan Shinnock, Anastasia da Monte, and Caitriona of Greenwood Isle. Mistress Kay Leigh Mac Whyte, East Kingdom Tyger Sygnet, was inducted into the Order of the Pelican last night for her long service to the Kingdom. 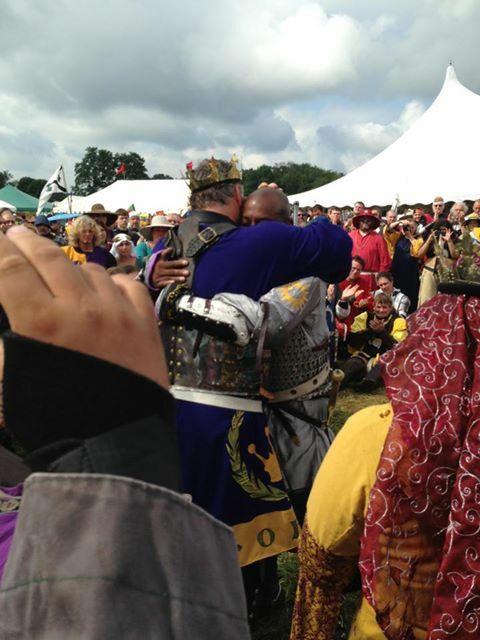 Baron Jibril was sent on vigil last night to consider the accolade of knighthood, which he accepted today on the field. 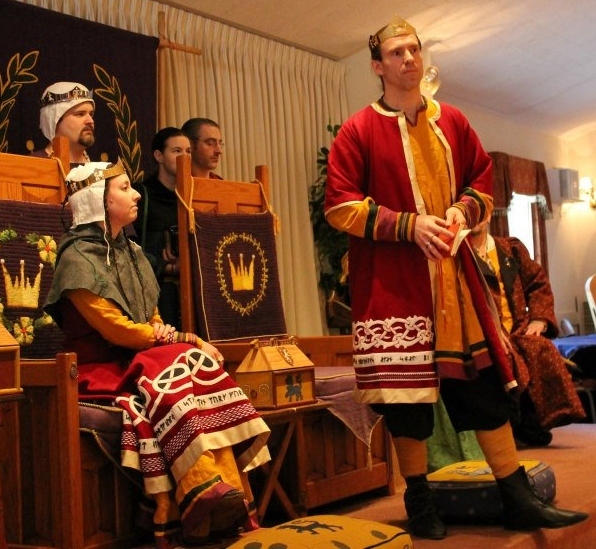 On the Schedule Calendar on the Pennsic site, it shows that East Kingdom Court will be Wednesday July 31st from 6pm-8pm in the new Great Hall. The date and time are correct – but the location is not. It will be held in the East Kingdom Battlefield Pavilion. Scribes: scroll blanks, homemade inks, raw materials, brushes, ink trays; personalized illuminations or heroic stories are also fun possibilities! Narrow workers: tablet weaving, card weaving, inkle, etc. And these are not the only possibilities! If you have another brilliant idea or burning creative urge, speak up!